Here is something I hope will be helpful to you. A few months back, I researched “typeahead” components – controls that let you search for data as you type – for use on Visualforce pages. When you want to provide a lookup to related data on a page, this can provide much better usability than the standard Salesforce lookup control. After I got typeahead.js working on my own page for an internal project, I thought it would be interesting to create a reusable Visualforce component. Introducing visualforce-typeahead, an open-source project you can find and install on Github. 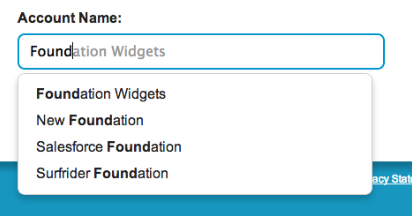 You can install the component and resources into your own Salesforce account (or sandbox) using this link. First post on new blog!